Stays that include the following days require a 3 night minimum: Fri, Sat Sorry, but the dates you selected require a 3 night minimum stay. Please adjust your search and try again. Stays that include the following weekdays require a 3 night minimum: Fri, Sat Sorry, but the dates you selected require a 3 night minimum stay. Please adjust your search and try again. Play Possum Trot FREE when play 3 Rounds Arrowhead CC, Glen Dornoch and Shaftesbury Glen. 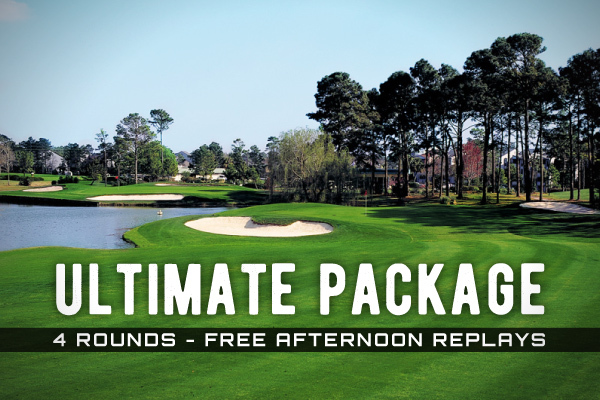 Includes lunch at golf course, free range balls and prebooked replays available after 1pm. Based on 4 night stay. Tax not included. Looking for a Custom Experience? DISCLAIMER: Package based on quad occupancy in a 2 Bedroom Golf Villa. Advertised from rate based on best available rate period for each season. Rates will vary based on stay dates. Replays must be played after 1:30 P.M. Lunch at course not available during Summer rate period. Dining voucher to Divine Dining Group is valid for up to $15 credit on food purchase. Valid at Bubba's Fish Shack, Nacho Hippo, Pawley's Raw Bar, Ultimate California Pizza & UCP Game Zone locations only. No cash value. Not valid with any other offer. Offer subject to change without notice. Disclaimer: Offer not valid on pre-existing reservations or in conjunction with any other discount. Rates subject to change without notice. All discounts are taken off rack rates, unit type and minimum night stay may apply to receive advertised rates. Management reserves the right to end promotion at anytime. Plus taxes & fees. Signup to Receive Monthly News & Discounts from Barefoot Resort Vacations. Signup to Receive Monthly News and Money Saving Discounts from Barefoot Resort & Beach Vacations.